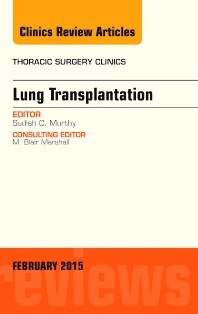 Lung Transplantation is covered in detail in this important issue of the Thoracic Surgery Clinics. Articles include: Candidacy for Lung Transplant and Lung Allocation; ECMO as Bridge to Lung Transplant; Single Versus Double Lung Transplant: Do Guidelines Exist? ; Extending the Donor Pool: Donation After Cardiac Death; Extending the Donor Pool: Rehabilitation of Poor Organs; Bronchial Artery Revascularization; Anastomotic Airway Complications Following Lung Transplantation: Implications and Interventions; Pleural Space Complications Associated with Lung Transplantation; Reflux and Allograft Dysfunction, Is there a Connection? ; Artificial Lungs: Are We There Yet? ; and more.